Iris Grace is a five year old girl with autism who's been attracting a lot of attention for her remarkable paintings. She is one of many examples of a "savant," someone that demonstrates remarkable characteristics in a specific area despite their diagnosis of a neuro-developmental disorder. ...and more, all done with levels of extreme brilliance and awe. Before painting she had yet to speak a word, and her paintings started in speech therapy, they were to be a technique to help her overcome her differences. This makes one wonder, what other hidden talents and potentials could these people possess? Had Iris never come across painting through her therapy, this hidden talent within her would have remained unknown. Autism impairs a persons ability to interact normally with others in a social setting. This is one of many potential differences on a very large scale spectrum. I personally feel that the ability to interact normally with others in a social setting is irrelevant. Maybe some of these kids are simply choosing not to interact? And there's nothing wrong with that, perhaps it's not an impairment? Perhaps it is. I also personally believe that many diagnosed with autism or with an autism spectrum disorder are those who are showing a potential evolutionary step for the human race, meaning that there is no ailment, only a more advanced, more evolved human being. Again, it's a large spectrum, with some children falling under extreme developmental differences, and other neuro-developmental ailments. These causes, I believe, are a result of numerous toxins found in our surrounding environment that could potentially explain the skyrocketing rates of autism over last few decades. 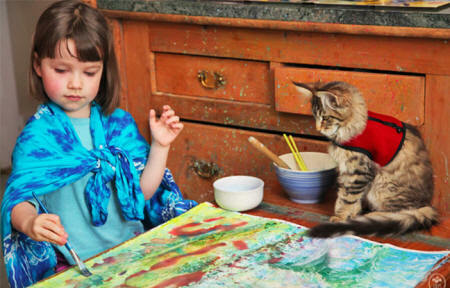 Her mother said she wanted to share her paintings with the world to raise awareness about her daughters condition, which currently affects 100,000 children in the UK and continues to rise dramatically. The paintings are currently being sold for $500-$1000. "When you are a parent or a teacher of a child with autism and you are trying to interact with them you are constantly looking for ways to find that key that will allow you into their world." The good news now is that Grace has finally starting to speak and express herself through art and movement. 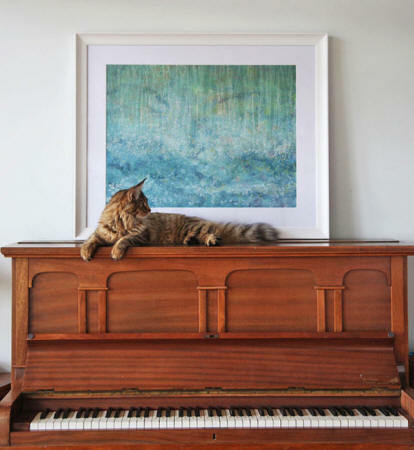 This one is amazing, do you see the cat in the painting? You can find out more about her paintings through the families website HERE. You can also visit the Facebook page HERE.